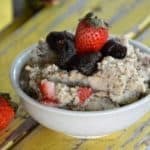 This recipe for strawberries & cream paleo fauxtmeal is hearty and delicious without all the traditional breakfast cereal grains. 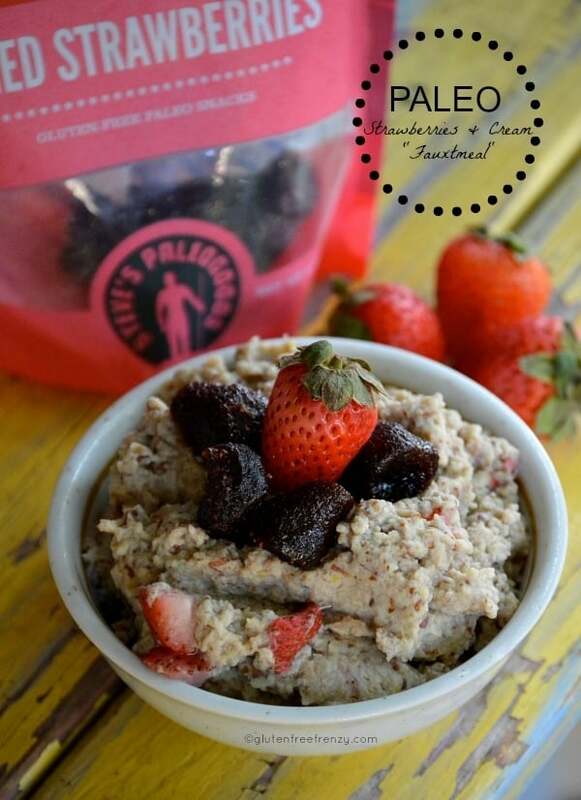 Start your day off right with our strawberries & cream paleo fauxtmeal and be energized for the rest of the day! 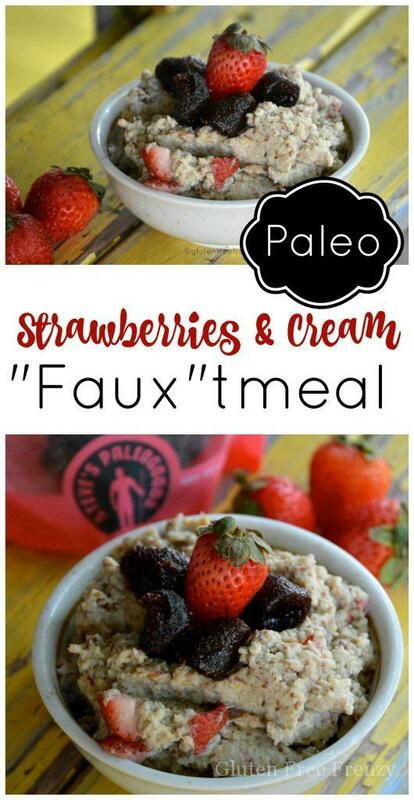 Mmm…strawberries & cream paleo fauxtmeal. After creating (and loving) our traditional no-oats “fauxtmeal”, my mind just wouldn’t stop. I had to create more variations! As a child, my favorite oatmeal was strawberries and cream. I decided that this would be a delicious breakfast to enjoy again as an adult, but wanted to make it without grains and dairy. I also wanted it to be higher in protein. To keep it Whole30 compliant, I also didn’t add sweetener but instead, just used fresh strawberries as well as topped it off with Steve’s Paleo Goods dried strawberries. They aren’t like the crunchy, dry strawberries you are used too. No, they are plump and moist and contain no preservatives or sulfates, only apple juice concentrate. You guys, these things are so addictive and deliciously sweet. I had to make myself stop popping them in my mouth in order to have enough left for this recipe. I love that they are made with clean ingredients and no added sugar. Feel free to stick with just fresh, but the addition of dried strawberries adds a very nice touch. Whether you are avoiding grains for a short time to cleanse your body or you have adopted a full time paleo lifestyle, this recipe will warm your tummy just like traditional oatmeal does. 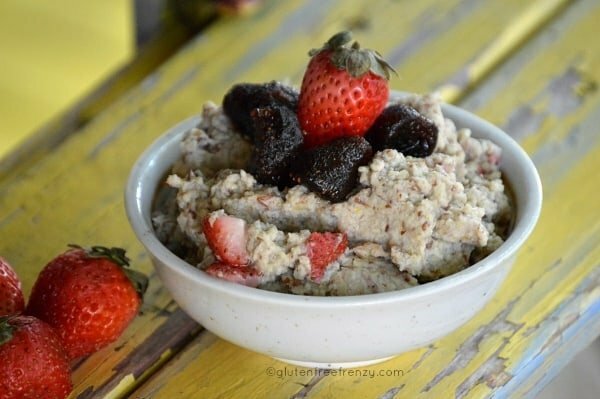 This paleo version of a childhood classic is nutty, sweet and creamy. Gluten-free, dairy-free or paleo? No problem, breakfast is served. I love hearing from my readers! What variations would you like to see me create? Leave a comment below and I will choose one to make and feature on the blog. Whisk all ingredients together, except strawberries, until well combined. In a pot over medium heat, cook whisking often so big lumps don’t form. Cook 8-10 minutes or until the consistency of traditional oatmeal. Eggs will be cooked through. Top with dried strawberries and more coconut milk or coconut cream. *This post is sponsored by Steve’s PaleoGoods. This means that I received monetary compensation and product for review. These are my opinions and my opinions alone. We reserve the right to only feature products we actually enjoy.